Michael Franti & Spearhead will play Laurelive in Shaker Heights for the second consecutive year. CLEVELAND, Ohio - Last week, Michael Franti got to experience something he didn't think he'd ever see: His son graduate high school. In 2014, Franti's son, Ade, was diagnosed with Focal segmental glomerulosclerosis (FSGS), a disease that left him with only 50 percent function in his kidneys. But with a healthy diet and lifestyle, Ade has managed to persevere. "My son being diagnosed was the worst news I ever got in my whole life," admits Franti. "Three years ago we didn't know if he could graduate from high school or what kind of life he was going to have. We don't know where it's going to go next, but he inspires me everyday." Ade became the motivation for Michael Franti & Spearhead's 2016 album "Soulrocker," which arrived just a week before the band played the inaugural Laurelive festival in 2016. 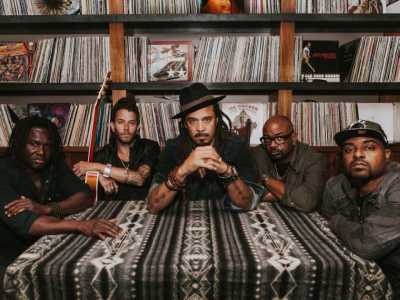 Franti & Spearhead will return for this year's festival, performing on Sunday afternoon. In many ways, Franti is the ideal musician for Laurelive. His social and environmental consciousness, and motto of live life to the fullest fit the overall mission of festival, something that isn't lost on the 51-year-old singer-songwriter. "I remember last year meeting some of the most ambitious and brightest young people that I've ever met," says Franti of the Laurel School in Shaker Heights. "The faculty and staff there are committed bringing incredible young women into the world and the festival represented that." Franti's set at last year's Laurelive was something to behold. It drew one of the largest crowds of the weekend, something he's been known to do all over the world. The band's current tour has gone everywhere from England and South Africa to Japan and Hawaii, usually packing outdoor venues. "We love playing outdoors because you never know what you're going to get," Franti says. "There's a certain energy where people are able to let loose and have space to dance be around other people who care about music and the planet as much as they do." Franti admits his message of positivity has been tested in recent months. The day we spoke to Franti on the phone came 24 hours after President Trump announced the United States would withdraw from the Paris climate accord. "I wake up some days, feel so sad and cry about it," Franti reveals. "What am I going to say to my grandkids when they ask me what I was doing when the world was in this state of environmental crisis? I want to tell them I was there doing everything I could do." Franti works with numerous charities and foundations, including Amnesty International, Operation Smile, Soles4Souls and Rock the Earth. He and his wife, Sara, have also founded Do It For Love, a wish granting nonprofit that brings children with illnesses to live concerts. "The one thing that my son has taught me more than anything else is the power of optimism," says Franti. "In some ways I feel it's a great time to be alive and engage in this fight and be able to tell our kids we were the ones who made a difference."